Would you open most deeply to the suitor… who approached you as though you were essentially lacking in intelligence of purpose, as though you had no interior dimension to speak of, no spiritual capacity or value; who thus saw you as fundamentally inferior to himself…; who related to you as though your existence were valuable primarily to the extent that he could develop and exploit your resources to satisfy his various needs, and whose motivation for knowing you was ultimately driven by a desire for increased intellectual mastery, predictive certainty and efficient control of you for his own self-enhancement? Or would you, the cosmos, open your self most deeply to that suitor who viewed you as being at least as intelligent and noble as worthy a being as permeated with mind and soul, as imbued with moral aspiration and purpose, as endowed with spiritual depths and mystery as he? To whom would you reveal your deepest truths (Tarnas, 2007, p. 39)? When we view the events of life with a symbolic eye, metaphysical teachings of the cosmos are transmitted, synchronicities seem to increase, and a re-animism of life takes place. If the most rational among us just acts as if the universe is enchanted and meaningful, that “creative Being” may kiss us on our eyes and touch our hearts—the cosmos can become our lover and soul mate. The initiation into the pathway of the Reluctant Metpahysician can come from a career change, an upsetting external event, a serious illness, a painful breakup, or an unravelling culture. Each of these can serve as an invitation to enter a deeper world behind the world. Places in nature, people we meet, our dream life, and visions we have can all help us to “trance-form” our life stance. To see the particular stories of my journey as a Reluctant Metaphysician, please see the book. To see a summary of some of those tales see the list of Personal Stories. • A Lawyer Captured by Astrological Forces? • Am I a Direct Descendent of the Baal Shem Tov? • Meeting Larry Dossey: Is Splitting Intention and Energy a False Dichotomy? 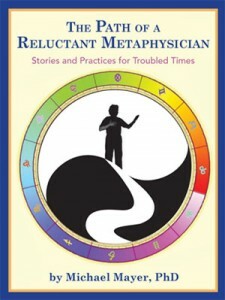 The book, The Path of a Reluctant Metaphysician, is one metaphysician’s "coat of many colors" that is passed on to the reader to help you on your journey through the seasons of your life. My hope is that from listening to my story, you will learn how to weave your unique coat of many colors to pass on to posterity. Like Joseph, each of us does not want to be sold into “the slavery of life” or suffer various wounds and betrayals due to the way of being in which we are cloaked, but from such experiences the fabric of each Reluctant Metaphysician's life is woven. The Metaphysics of Myths: To extract primordial wisdom from mythic tales to help us navigate distressing times. Age-old, Energetic Metaphysical Traditions: To become initiated into time-tested practices, such as Tai Chi and Qigong to keep our sense of equanimity. The Metaphysics of Bodymind Healing and Psychotherapy: To learn self-healing methods to deal with times of crisis and to find our life stance. Political Metaphysics: To draw from the world behind the world to help us cope with, and develop political actions for, the troubled times in which we live. The Path of a Reluctant Metaphysician speaks to the importance of a holistic spiritual philosophy in our current times of the “great unraveling” of our political, economic, cultural, and ecological world. Here you will find an approach to finding your life stance in such troubled times. The metaphysical path is an “all vector approach” that incorporates both “spiritual” and “soulful” pathways, traditions of postural initiation such as Tai Chi, mythology, depth psychology, bodymind healing methods, a non-deterministic approach to astrology, and a multi-dimensional approach to the political sphere. I hope you’ll pick up the book The Path of a Reluctant Metaphysician to discover how to weave your tapestry of metaphysical traditions to help you find your center (axis mundi) in troubled times. Michael Mayer is a reluctant metaphysician and storyteller who uses ancient sacred wisdom traditions to help people find healing pathways through troubled times. Dr. Michael Mayer is a psychologist in private practice, author of twenty publications, including six books and various peer-reviewed articles on bodymind healing. He does workshops on his integrative approach at professional conferences, universities, hospitals, and various workshop locations such as Esalen Institute. For a more complete bio click here. Dr. Michael Mayer has helped numerous people through his knowledge of psychotherapeutic principles, internal martial arts practices, and life style enhancement. Readers of this book will find Dr. Mayer's personal story an engrossing one, and may be motivated to recast their own beliefs and behaviors, even reluctantly, into a metaphysical mode. For more testimonials see "What Others Are Saying." Comment on the book, engage in community discussion. You can also e-mail Dr. Michael Mayer directly at [email protected].